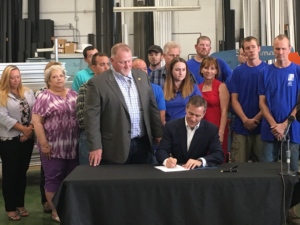 Republican Governor Eric Greitens signed four bills into law Wednesday during a ceremony at a window installation company in Kansas City. The most controversial of the measures restricts plaintiff’s claims in injury lawsuits. The new law limits those claims to the actual amount paid for medical care and prohibits a person from seeking additional damages. The measure ties the cost of medical care to the dollar amount paid rather than to its actual value. Another bill signed by Greitens specifies requirements for plaintiff’s who place time limits on their settlement demands before a lawsuit proceeds to court. It stipulates a time-limited demand to be no less than 90 days, where previously there was no minimum. For example, in a case involving a death, an insurance company wouldn’t be required to settle with a plaintiff for 90 days. The measure further permits insurance companies to intervene in cases where they’ve denied the plaintiff coverage. A third law deals with workers’ compensation cases. It defines “maximum medical improvement” as the point in time when the condition of an injured employee can no longer improve, and bans any claims for benefits beyond that time. With the new stipulation, a plaintiff will now have little recourse if their condition deteriorates at a later date, or if a doctor’s diagnosis is incorrect. The measure also places more burden on the employee to prove employer discrimination in workers compensation cases. Supporters of the three new laws say they will eliminate frivolous lawsuits. A recent survey of businesses ranks Missouri as the eighth worst state in the nation for frivolous lawsuits. Democratic Assistant House Floor Minority Leader Gina Mitten said Governor Greitens was gaming the legal system to favor business interests over individuals. The Missouri Chamber of Commerce has been a strong backer of all the lawsuit bills passed this year by Republican majorities in the legislature. At this point, all but one of them has been signed into law by Governor Greitens. Chamber President Dan Mehan praised the action taken by the governor Wednesday. Attorney Jay Benson, former president of the Missouri Association of Trial Attorneys, thinks the bills signed Wednesday by Greitens further limit the ability of individuals to seek justice from wrongdoing. Greitens also signed a bipartisan bill to create four adult high schools in Missouri in an effort to help the state’s 500,000 residents who don’t have a diploma. 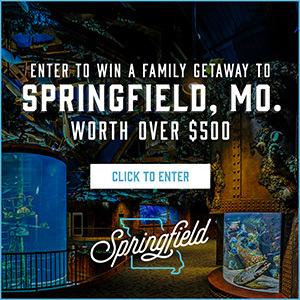 The high schools will be created in the St. Louis City, Poplar Bluff, Springfield and Columbia areas. A successful bidder will be required to invest at least $2 million in facility infrastructure. The schools will also have “life coaches” that will teach soft skills such as how to interview for a job and how to keep a job. Students at the adult high schools will have to be at least 21 to attend the schools.